If you're working around an antique family heirloom or a prized wood furniture piece that you just can't part with, try pairing an upholstered or metal bed. The different materials compliment each other without clashing like similar wood finishes would. The Curated Collection has multiple upholstered beds to choose from and the show stopping Respite Canopy Bed for a unique metal and upholstered option. 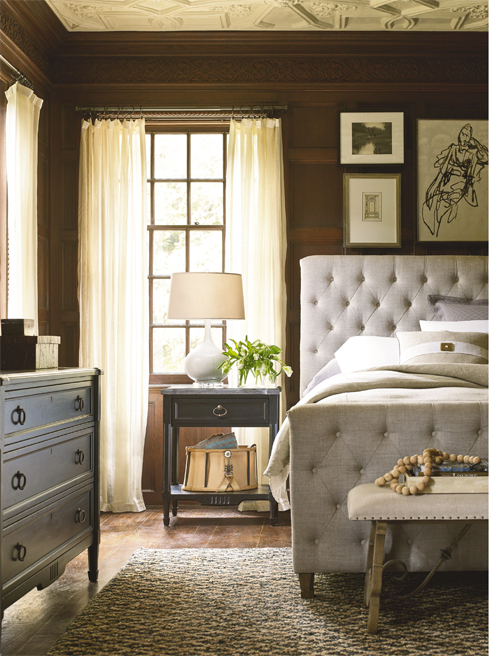 The Respite bed features a metal frame with vintage character and upholstery on the headboard. A khaki colored tape with spit-tack nailhead trim details the edges of the upholstered headboard. How do you create a cohesive look that's cozy without warm colors? -Use a variation of textures and hues within the same tones - the Curated Collection is comprised of pieces and colors that have already been selected to coordinated with one another, so the guesswork is gone for you. -Layer it up! Create a layering effect with two rugs, layered linens on the your bed, or pieces with mixed media like nightstands with bluestone tops or wood dressers with metal mirrors. -Color! Stick to the 60/30/10 rule - 60% of your room should be the dominant color like layered neutrals, 30% should be an accent color like turquoise, and 10% should be the remaining colors to fill your room and create a room that looks finished. Need help pairing your unique pieces with complimentary options for the perfect eclectic look? Submit some information about your room and our Style and Design Experts and Design Team will contact you with design ideas to make it simple for you! Visit the Belfort Furniture showroom to view the Curated Collection in person. With over 100,000 square feet of showroom space in our expansive campus, you'll find plenty of ideas and inspiration for your home design.